EMV technology certainly is “the buzz” in the payment processing world right now and has been for quite a while. Card processors and card issuing banks have been playing the chicken and egg game for years because of the cost to implement this new technology into the marketplace. Banks like Chase or Bank of America didn’t want to produce EMV “chip” cards before the technology/hardware was in place and card processors like First Data and Card Connect didn’t want to force equipment and technology updates on their clients until their customers had these chip cards in hand. The three mega card brands (Visa, Mastercards, Europay) have been working on this global card acceptance technology for years now and it is finally coming to fruition in the United States. The game of “you go first” is now over. EMV is here to stay and there is a deadline of October 1st, 2015 to comply. It is the new global standard in security technology in the credit card processing space and because of it every business (like yours) that wants to keep accepting credit card payments needs to comply by adopting this new technology. Payment processing security has evolved over the years and this new method allows the micro computer chip which is embedded and visible on the front of the consumer card to store sensitive data instead of using the magnetic strip. The chip technology is said to be MUCH more secure than the magnetic stripe “swipe” methods. Chip technology is said to reduce fraud at staggering rates due to the dynamic authentication at the point of sale. Magnetic stripe (swipe) authentication is static and data is more easily compromised through the use of a simple low-cost card reading device known as “skimming.” Skimming allows for counterfeit cards to be reproduced and used in both card present and card not present environments. 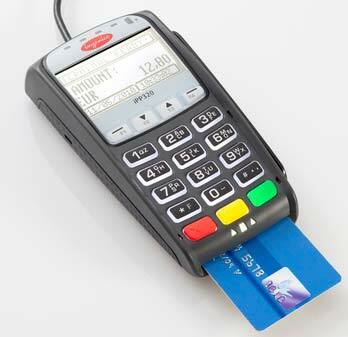 EMV cards validate the authenticity of the card being presented at the time of sale through the EMV enabled terminal. If it’s not an authentic card issued by a bank, the transaction is declined. The technology exists for card present transactions. However, as I mentioned above, the higher security present in EMV chip cards also prevents the practice of skimming and thus the spread of fraudulent cards to card NOT present environments. The new EMV-ready terminals have a slot (typically at the base of the unit) that allows for the card to be inserted in an ATM style fashion rather than swiping the card through a magnetic reader. Once the chip is read by the terminal the customer is asked to enter a pin OR sign (based on the issuing bank requirements) for the purchase to be complete. If your business operates in a card-present environment it applies to you! There will be a huge shift in liability. By October of 2015 if you accept a transaction from an EMV chip card by swiping with the magnetic card reader instead of the new EMV “chip and pin/sign” and the transaction turns out to be fraudulent, YOU will be held liable for the loss/costs. I’m sure I don’t need to remind you about the Target and Home Depot breaches that have occurred in the past. Those who don’t comply are opening themselves up for potential losses. Can you imagine if you had to foot the bill for a chargeback because you didn’t buy a new credit card terminal which costs $200 or less? I wouldn’t want to be in that position either. It’s simple. Just buy a new terminal that is EMV-ready. Everyone is saying don’t wait to upgrade and for good reason. The Ingenico ICT220 (or ICT 250) and the Verifone VX520DC terminals are my two recommendations. Both retail for under $200 and will make your business EMV-ready! The deadline is rapidly approaching so act now by simply getting new equipment. It’s just plain smart… get on board! Look, EMV is a smart move for everyone involved. The technology just plain works and it’s been proven in the UK already. That means less charge backs and ultimately less cost to you in the way of interchange fees and merchant account processing costs. Plus, and perhaps more importantly, this is a huge opportunity to make your customers feel that ALL purchases at your company are going to be safe and secure! As consumer awareness grows so will the practice of using EMV cards instead of magnetic stripe cards so don’t you want to be ready? Forward this article to a friend, colleague or business associate. Spread the word so that business owners (and consumers) know about the new EMV technology standard. Times are changing (forever and always) so be an early adapter to the new EMV “chip card” technology!